Women with rackets in hand, dressed in white, wearing berets, and with colored bows and ties. They were not the same players you would see at Wimbledon (England) during the same period, the second decade of the last century. 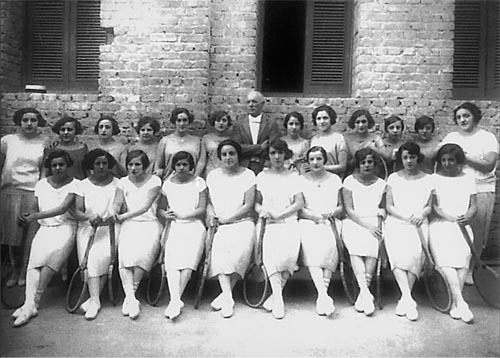 They were racket players, women, who broke into the professional Basque pelota industry in 1917 and for 63 years, until 1980, took their game to different cities with frontons in Spain and beyond, to Mexico, Cuba and Florida (USA). All of this started from nothing. Or better said, from a visionary entrepreneur, former jai-alai player, named Ildefonso Anabitarte Anza. The first shots from the 16 racket players in the line-up were on at 19-meter-long court, the Cedaceros Fronton of Madrid. Success was immediate; within days of opening, events were filled. Anabitarte, the promoter who made a fortune as a player in America, bought the “Moderno” Fronton on Doctor Cortezo Street in Madrid. He demolished it to build the Figaro Theatre (being married to a Zarzuela singer) and just across the street, he constructed the “Madrid”, which did not take long to become considered the Cathedral of racket games. Women racket players from the fronton of Havana, Cuba, early 20th century. The integration of women into professional sports in Spain at that time was a true revolution. Two years later, in 1919 (to give us an idea of the social context in which this phenomenon occurred) women’s tennis at Wimbledon emerged by the mere fact that a Swiss player, Suzanne Lenglen, dared to play exposing her calves and forearms, causing quite a scandal in the prevailing Victorian morality among the English. In fact, it is likely that Anabitarte’s revolutionary idea was inspired by women’s tennis, since the racket modality was an adaptation for frontons from what was being played on tennis courts; however, introducing the racket modality to the betting world, the backbone of the industry of professional Basque pelota in all of its modalities. In addition, Anabitarte introduced various changes, the racket as a tool was modified to be more robust and adapted to hit new material; the balls, as opposed to those used in tennis, at the core the rubber would be sheathed in leather, reaching a weight of 70 grams. María Carmen Lasagabaster, Amaia, from Eibar (province of Gipuzkoa), in Barcelona around 1950. As with other modalities such as Jai-Alai, the changes resulted in a faster game; and in the end made the game even more spectacular. The visionary entrepreneur created different schools in the Basque Country in order to provide labor and new blood. From now on, to be a racket player would be viewed as a job and as such, it was common that the apprentices paid for their training, and were responsible for acquiring their own equipment (rackets, balls, clothes) in addition to paying for court rental for the time used. The new modality of racket ball was an artificial creation. The presence of women in Basque pelota and early twentieth century rural sports was none at all in the Basque Country. So it was therefore a revolution to integrate women into a modality created specifically for industrial exploitation. The new profession of racket ball acted as a tremendous attraction for future candidates. It can be explained by the upgrade in living conditions from traditional, small towns, to big cities, with the possibility of travelling and the idealization of opening horizons and getting to know the world. I, myself, as a former professional jai-alai player, experienced that feeling. The temporary return to places of origin from where they were playing created even more interest. In the early days the place of origin of racket ball was the Basque Country, however, with the opening of new frontons, schools were founded in several cities in Spain like Madrid, Valencia, Seville, Salamanca etc. Women racket players, considered the great forgotten of Basque pelota, raised, at that time, a similar or greater passion than the male pelotari figures of other modalities. They were after all, the princesses of Basque pelota, the first female athletes to have a professional contract in some forty courts spread throughout Spain, Mexico, Florida and Cuba. The first appearances overseas were in Marianao (Cuba), in 1921. One year later, in the Habana-Madrid fronton of the Cuban capital with a team of 17 racket players in the line-up coming from Madrid. It is estimated that in 1946 there were some 300 young women players with professional contracts at different frontons. The city of Barcelona housed four frontons for professional women racket players. A craftsman from Mutriku (Gipuzkoa), Valentín Zumalabe, famed builder, manufactured up to 3,000 rackets a year. Basque Women racket players in the “Metropolitano” fronton in Mexico City. 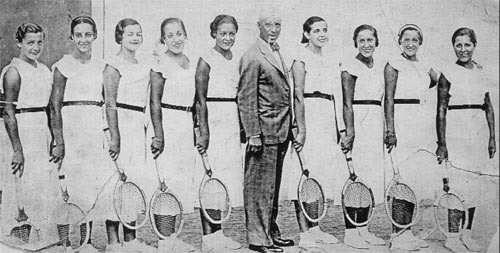 According to Aitor Acha, Professor of the Cardenal Cisneros University School, the beginning women racket players of the 1940s earned about 300 pesetas per month. In 1957, stars earned about 5,000 pesetas a month, when the average was at 2,500 to 3,000. However, according to the same sources, in Havana, one could expect to earn 30,000 pesetas per month. And in Mexico, at the Metropolitan fronton in 1960, players made over 216,000 pesetas a month. 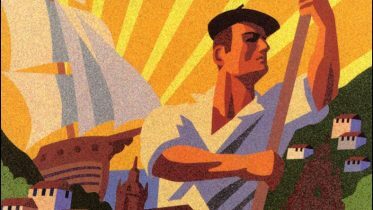 The racket modality suffered a serious blow after the Spanish Civil War (1936-1939). In the new socio-political context, the Franco dictatorship, for the Female Section of the regime, the woman was to be considered a minor who passed from the father’s tutelage to the husband’s. The woman was to be a housewife, mother and devoted wife. Her main task was caring for children and the home. New rulers with the Franquist General Moscardó as a national delegate of sports felt that the profession of racket player was improper for women and decided to close frontons. There was a belief that the practice of the sport by women would cause sterility. The reaction in the industry was swift and managed to soften the measure replaced by preventing the opening of more fontons and by banning new Federal licensing. The racket players that continued active also had to adapt their professional attire, lengthening skirts and making sure that tops had sleeves. 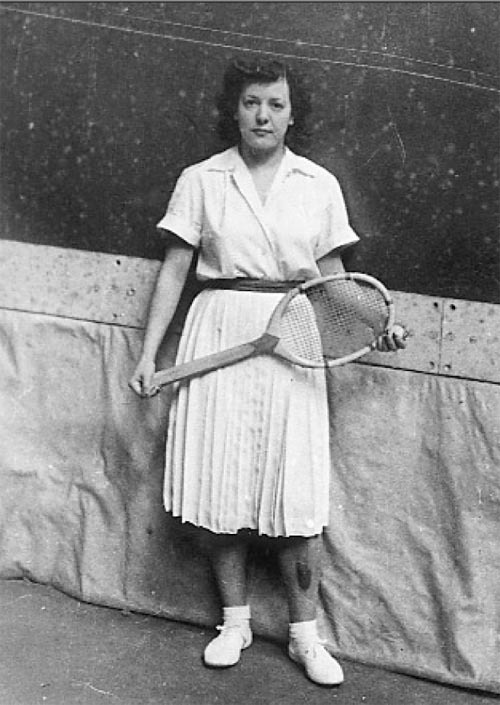 Basque Women racket players in the Madrid fronton in the early 40s of the twentieth century. However, going back to the year 1922, during the dictatorship of Primo de Rivera, authorities banned betting in Spain except in frontons, national lotteries and football (soccer) betting. This measure, which was not changed until the arrival of the democracy in 1976, contributed to the flourishing of the Basque professional pelota industry including, of course, the racket modality. This protective measure for the world of Basque pelota industry (prohibited casinos) explains the boom that various forms of industrial Basque pelota experienced (hand, pala, jai-alai, remonte and racket) throughout most of the 20th century. Interestingly, pelota modalities with a playing instrument, including the racket for women, diminished as the Spanish state modernized until becoming a residual game or disappearing completely. The boom of professional ball was due in large part to the legal norm banning betting with the exception of at the frontons. There the female form of racket found its place, giving work to hundreds of women. The flame for the sport of women’s racket was gradually extinguishing until 1980 when it was completely put out. Now, virtually nothing remains from the professional racket modality (except perhaps the practice of racquetball). From that reign of women racket players, putting on a show, exposing arms and legs at a time when everything was considered sin, there is no more left than a memory and testimony of the many players recalling a glorious time, aware that those times are gone forever. 4 Comments on "The History of Basque Women as Sports Professionals in Frontons"
Si os gusta esta historia, os recomiendo leer este libro de mi amigo Antonio Garrido en el que narra la historia de la madre de su esposa. ¡Precioso! Perdona Suso, no das la referencia del libro y el enlace no está bien. ¿Puedes decir título y autor, por favor?